Growing evidence shows us that climate has changed in the recent decades, and the scenario for the future will most likely worsen. A set of climate variables is being developed to monitor climate change, but this is not enough to keep track if its effects on ecosystems. It’s imperative to understand and quantify how ecosystems functioning are affected by and respond to these changes, and ecological indicators based on biodiversity metrics are one of the tools to do this. 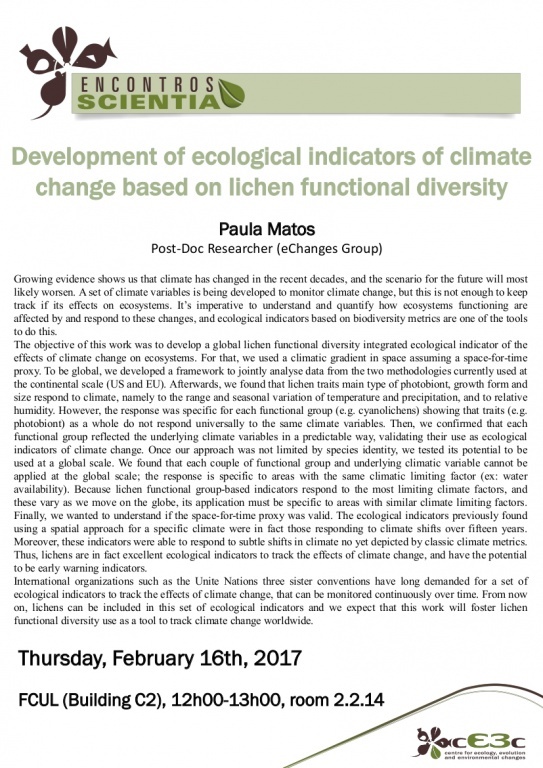 The objective of this work was to develop a global lichen functional diversity integrated ecological indicator of the effects of climate change on ecosystems. For that, we used a climatic gradient in space assuming a space-for-time proxy. To be global, we developed a framework to jointly analyse data from the two methodologies currently used at the continental scale (US and EU). Afterwards, we found that lichen traits main type of photobiont, growth form and size respond to climate, namely to the range and seasonal variation of temperature and precipitation, and to relative humidity. However, the response was specific for each functional group (e.g. cyanolichens) showing that traits (e.g. photobiont) as a whole do not respond universally to the same climate variables. Then, we confirmed that each functional group reflected the underlying climate variables in a predictable way, validating their use as ecological indicators of climate change. Once our approach was not limited by species identity, we tested its potential to be used at a global scale. We found that each couple of functional group and underlying climatic variable cannot be applied at the global scale; the response is specific to areas with the same climatic limiting factor (ex: water availability). Because lichen functional group-based indicators respond to the most limiting climate factors, and these vary as we move on the globe, its application must be specific to areas with similar climate limiting factors. Finally, we wanted to understand if the space-for-time proxy was valid. The ecological indicators previously found using a spatial approach for a specific climate were in fact those responding to climate shifts over fifteen years. Moreover, these indicators were able to respond to subtle shifts in climate no yet depicted by classic climate metrics. Thus, lichens are in fact excellent ecological indicators to track the effects of climate change, and have the potential to be early warning indicators. International organizations such as the Unite Nations three sister conventions have long demanded for a set of ecological indicators to track the effects of climate change, that can be monitored continuously over time. From now on, lichens can be included in this set of ecological indicators and we expect that this work will foster lichen functional diversity use as a tool to track climate change worldwide.